Lieutenant General John Bell Hood. It is estimated that 56,000 Texans served in the Confederate Army during the Civil War, yet the approximately 4,000 men, organized into thirty-two companies that formed the Texas Brigade, were the only Texans who fought in both theaters of operation. They have been compared to the famous Stonewall Brigade in terms of bravery, skill, and fortitude. As was the case with numerous troops throughout the war, the actions of the Texas Brigade directly contributed to the outcome of certain battles and the general course of history. Although the Texas Brigade participated in renowned battles such as Gettysburg and Antietam, the achievement for which they are most acclaimed occurred during the Peninsula Campaign at the Battle of Gaines’s Mill. The imposing John Bell Hood was born in Owingsville, Kentucky in 1831, yet was a self-declared Texan. He had travelled extensively through Texas and was impressed with the possibilities the state held. Additionally, he was dismayed that his home state of Kentucky remained neutral rather than joining the Confederate States of America. (C.S.A.) Hood was a West Point graduate, class of 1853, yet was able to maintain a frontier attitude, which immediately endeared him to his men. At the time of the Battle of Gaines’s Mill, the Texas Brigade consisted of the 1st, 4th, 5th, Texas Infantry regiments, the 18th Georgia Infantry, and Wade Hampton’s South Carolina Legion. 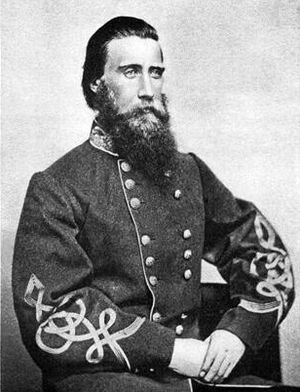 Brigadier General Louis T. Wigfall, a lawyer born in South Carolina, was initially given command of the brigade. After he resigned to accept a seat on the Confederate senate, command of the brigade was given to Hood on March 12, 1862 and the unit was forever known as Hood’s Texas Brigade. Battles near Richmond during the Peninsula Campaign. The Peninsula Campaign was waged from April through July 1862. It was during this time, at the Battle of Seven Pines, that General Joseph Johnston, the supreme commander of the Army of Northern Virginia was seriously wounded. The following day, June 1, 1862, command of the army was given to Robert E. Lee.General Lee took command a mere three weeks before the most ferocious battles on the peninsula occurred. From June 25 through July 1, the Seven Days Battles occurred. There were nine battles that took place during this short span. The goal of the Federal Army, under the leadership of General George B. McClellan, was to push north from the tip of the peninsula and attack Richmond. Hood’s Brigade led General Thomas “Stonewall” Jackson’s Army down the peninsula to prevent the Federal troops from advancing on Richmond. The Union Army was approximately ten miles from the Confederate capital. General McClellan, imagining the Confederates had a far greater numbers of troops than they actually did, ordered General Fitz John Porter to fall back and establish a defensive position for a strong rear guard. Porter entrenched his men just to the southeast of a mill owned by Dr. William F. Gaines. His position was ideal for maintaining a strong defense as his troops were positioned on a plateau behind Boatswain’s Creek. Additionally, on their retreat to this position, the Federal troops felled trees and created as many obstacles as possible to detain the Rebels on their attack. General Lee had planned this attack to be the largest of the war. In total he amassed 57,000 troops; however, Jackson was late to arrive with his army, which included the Texas Brigade. As a result, Lee was unable to carry out his strategy of a full attack of the center and both flanks of the entrenched Yankees. 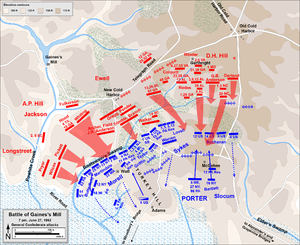 By being late with his men, Jackson afforded General Porter the time needed to establish his supreme defensive position, thus denying Lee the opportunity to execute his plan. Generals Hill and Longstreet were charging the Union line throughout the day of June 27, 1862, but were unable to penetrate as the terrain was deadly for the troops on the offensive. In order to break Porter’s line, the Confederate soldiers were tasked with crossing an open plain of 700-800 yards below the hill on which Porter was entrenched. Following the open plain, the soldiers of the South were forced to wade through Boatswain’s Creek, which was a shallow stream approximately ten feet wide that was bordered by steep and unfriendly banks. All of this was to be attempted while Porter’s group of 25,000 troops, a cavalry battalion, and an artillery battery that consisted of eighteen guns, looked down on the advancing Confederates.Generals Longstreet and A.P. Hill attempted the advance throughout the day but were unable to attain ground any closer to the Union line than that of the banks of Boatswain’s Creek. 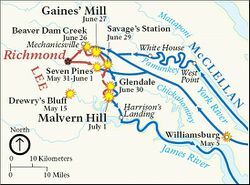 On the morning of June 27, Hood’s Texas Brigade reached the Gaines’s Mill battlefield and were organized in a battle line. Map of the Battle of Gaines's Mill. When Hood’s men reached the top of a rise in the terrain, approximately 150 yards from Boatswain’s Creek, they came upon numerous troops clinging to the ground who would go no further. It was at this point that Longstreet’s and A.P. Hill’s men were halted. The lieutenants of the companies the 4th encountered, thought to be Virginia troops, urged the Texans not to proceed further. Hood and his men ignored the warning and started down the other side of the rise toward the creek. Once the continued march began, there was an immediate eruption of Union fire power. Hood maintained the order to hold fire and urged his men forward. 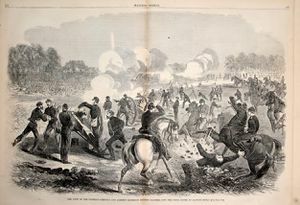 Depiction of the Battle of Gaines's Mill. When Porter’s troops who were in the first line of battle fled to the rear, the men in the second row of entrenchments followed suit. It was at this point that the 4th Texas regiment was joined by the right wing of the 18th Georgia group. Together these men pursued the Federals further up the hill toward the rear of the Union defensive position.As the 4th Texas and 18th Georgia chased the Yankee troops, the 1st and 5th Texas regiments, along with the South Carolina Legion at last reached the rise of the hill. These three regiments marched through a heavily forested and swampy terrain, thus the delay in their having joined the first two regiments on the attack. The united five regiments continued to pursue their enemy and finally were able to collapse the Federal left flank. The battle line crumbled and the 4th Texas regiment was able to reach the summit of the hill and capture fourteen of the eighteen Federal artillery guns. After Gaines’s Mill, Hood’s Texas Brigade participated sparingly in the Battle of Malvern Hill they were then ordered to camp in Richmond. They were at last done fighting on the peninsula. They rested and recovered in the city until the end of July 1862. Hood’s Texas Brigade is considered by historians and military experts to be second only to the Stonewall Brigade in terms of tenacity and valor of all of the brigades that fought for the Confederacy during the American Civil War. Hood, like Jackson, was a leader who displayed no fear and projected a fierce sense of pride and determination among his men. Of the many leaders who commanded the brigade, it was Hood who instilled an ethic and confidence in the men who comprised the brigade that still bears his name. ↑ Harold B. Simpson, Hood’s Texas Brigade: Lee’s Grenadier Guard (Dallas: Alcor Publishing, 1983), 9. ↑ J.B. Polley, A Soldier’s Letters to Charming Nellie (New York: Neale Publishing Company, 1908),54. ↑ Nicholas A. Davis, Chaplain Davis and Hood’s Texas Brigade, ed. 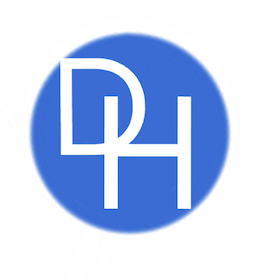 Donald E. Everett (San Antonio: Principa Press of Trinity University, 1962), 88. ↑ United States War Department, War of the Rebellion: A Compilation of the Official Records of the Union and Confederate Armies, 128 vols. (Washington, D.C.: Government Printing Office, 1888),series I, vol. 11, part II, 291.Hereinafter cited as OR. ↑ J.B. Polley, Hood’s Texas Brigade: Its Marches, Its Battles, Its Achievements (1910, repr., London: Forgotten Books, 2012), 48. ↑ OR, series I, vol. 11, part II, 43. ↑ OR, series I, vol. 11, part II, 973. ↑ Letter from Basil Brashear to Frank B. Chiton, March 5, 1911. Quoted in Simpson, 132.